New Orleans Almost all of the headlines from Honduras in the wake of the recent election have been very, very troubling. The earliest reports indicated that a more progressive party and candidate was leading the voting decisively over the incumbent who had won the presidency in the wake of the United States backed golipista coup pulled off by the conservatives to steal the seat from the popularly elected president. This coup has roiled politics in Honduras for years, even as some stability had returned. Later as the reporting on the vote count stretched out from days to over a week, the incumbent’s party claimed to have been re-elected by 50,000 votes. Recounts are now being demanded because of these and other irregularities in both the voting and the tabulation. Protests are widespread given the uncertainty, and both sides are claiming victory. 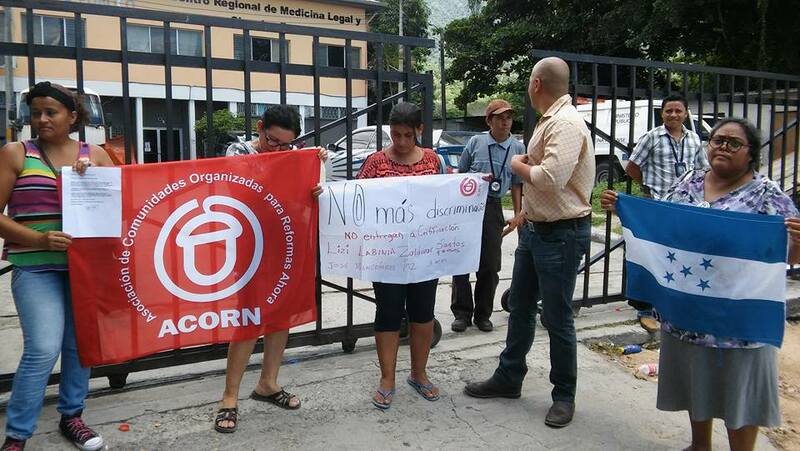 ACORN has been organizing in Honduras for years in Tegucigalpa as well as in San Pedro Sula and the working-class suburbs in this industrial city, sometimes touted as the most dangerous in North America. The issues are rock solid and often have centered around winning basic city services in the colonias like potable water, recreation centers, paved streets, and school improvements. The issue of security has been particularly intense in our neighborhoods, and they were regularly among the most impacted, as threats to families forced many to send children fleeing to the US border during the refugee crisis poorly handled by the Obama Administration. ACORN has pushed the government on this issue, and even won some support from the First Lady directly in helping repatriate children that were in holding camps in the US after having been caught at the border. Nonetheless, the election brought all of these tensions around the coup, the disenfranchisement of low and moderate income people, and the continued outrage over the undermining of Honduran democracy to the surface. In a lesson that speaks to the United States experience, the resistance, so to speak, continued to burn as hot coals even when the flames were no longer as visible to outsiders past the ring of fire. Reports of thousands, perhaps tens of thousands, of women being motivated to run for office in elections post-Trump, find an analogy in the awakening of grassroots political interest and involvement in Honduran communities as well. Recently, in a call with ACORN Honduras organizers, we came to understand something more of the full measure of the changes and continued reactions at the grassroots level where the coup polarized and politicized so many. In San Pedro Sula and its suburbs four ACORN members had been elected as representatives to the national Congress, Sherly Ariagas, Edgardo Castro, Samuel Madrid, and Patricia Murillo, who was one of the founding leaders of San Pedro Sula ACORN. Four city councillors were elected, one in Tegucigalpa, and others in the San Pedro Sula working class suburbs of Cholomo, Progresso, and San Antonio Cortes. ACORN members and supporters were also elected as mayors in Macuclizo and San Antonio Cortes. Certainly, it says a lot about ACORN’s work and organizing in Honduras in recent years, but no matter how the national election is finally determined, perhaps more importantly, these kinds of election victories, multiplied many times over throughout the country at the local level, also speak to a wave of change that is coming in Honduras that will not be stopped and cannot be stolen. This entry was posted in ACORN, ACORN International and tagged ACORN Honduras, Honduras Elections by Wade. Bookmark the permalink.